There's only one way of doing justice to this spectacular documentary series and that my dear readers is the magic of Blu-ray. If I could review this series in two words, it would be phenomenal and amazing, not just because of the spectacular video quality but the down to Earth explanations of the various aspects of this blue planet. Add the credibility of David Attenborough who lends his voice to the commentary and it's easy to get thoroughly drawn in this beautiful planet. As soon as the disc was put into our Blu-ray, I immediately knew that I was in for a treat as the viewer is taken on a global journey of information from animals to weather and landscapes. The first episode entitled From Pole to Pole goes from one side of the planet to the other which gives the viewer a snapshot of the various animals that are effected by our forever changing weather. Best of all, the documentary does not go into too much detail as we are given snapshots of a variety of creatures from polar bears to the rare Russian leopard that is almost extinct. From tiny creatures such as birds to powerful giants such as Elephants, the creators of this documentary follows a variety of animals as they make their way from winter to summer such as the crossing of the elephants from the deserts to the green savannas. Episodes 2 and 3 show other wonders of this planet from the majestic mountains of the planet to the world's reliance on fresh water. The video quality of Planet Earth is amazingly detailed and looks quite spectacular on our high definition LCD. This is what high definition is all about and what better way to showcase the amazing wonders of our planet than Blu-ray. The cinematography is quite unparalleled and only assists with the information and it's easy to get quite caught up in the entire process, thanks to the quality. Of course, at times, the video quality does become a little grainy but fortunately these times are far and few as the colours of Earth come to live, thanks to the sharp images. The sound of the series matches the video well, although not as stunning as the video, it does help draw you into the documentary as you hear the various sounds of this planet and even the subtle ones such as the sounds of cracking ice or the background ambience of the rainforests. 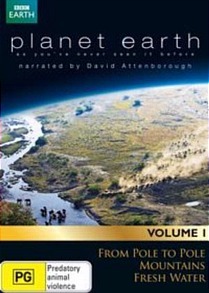 In conclusion, Planet Earth can be watched by everyone and the effort put into this movie which included a budget of $25 million dollars, 40 cameraman and over 200 locations across the globe really makes this series shine. It's definitely a blockbuster movie from start to finish! Recommended!